My heart feels hurried. I wish I could claim it was just a season, but if we're being honest with one another this has been a forever kind of hurry. Perhaps you know this hurried feeling. The hurried heart weighs on our spirit. The hurried heart is robbed of joy in the ordinary every day. The hurried heart misses the opportunity to see the glory of God in the mess of the mundane. I'm no stranger to the hurried heart. We stand at a crossroad every morning to decide what kind of Sower will we be. Will we move out hastily allowing our seed to fall along the path being swooped up by the enemy? Will we grab the seed only in our need and want never allowing it to take root? Will we allow it to fall among the thorns being choked up and suffocated? Or will we intentionally see that our seeds are sown in good soil. It's time we take back what the enemy has stolen, and reclaim the joy of sowing seeds in good soil. It's a process, though, to be Sowers of seeds in good soil. There's a cultivating that takes place in the little by little tending of our hearts. It takes slowing down and settling into what He has for us. Here's what I know: we've got to be intentional to ask His seed to fall on good soil in our life and to receive it well. Are we confident enough to ask that? Are we courageous enough to ask the Lord to bless us with a harvest yielding a hundredfold? Here's the crossroad of my season: To pray for harvest in a season of grief, loss and illness requires more faith. Seasons of praying for ongoing harvest is easier. It just is. But God uses our seasons of suffering to grow our dependence on Him. In my suffering He is sending seeds (His Word) deeper into the soil of my soul shooting out roots that can withstand the harsh winds of hard seasons. Coming out of the harvest of 2016 into the sowing, suffering season of 2017 has been tough on my heart and tested my ability to persevere. Meanwhile God has begun to whisper a message He sowed into my Spirit years ago: get back to wholehearted joy even in this hard season. Did you know the olive trees in the Holy Land need both the harsh East wind and the refreshing West wind in order to be fruitful? Similarly, it takes both the gentleness of the West wind and the harshness of the East winds for us to flourish in the way He intended. It takes both calm and chaotic seasons for us to bear fruit. We cannot have the hundredfold harvest without the suffering. So, I'm digging in. I'm seeking His wisdom and revelation on this year of well (my word of the year). I'm counting the fruit of 2017, as meager as it may feel at first blush. Most importantly, I'm rejoicing that His seeds on good soil produce a persevering crop despite harsh winds. 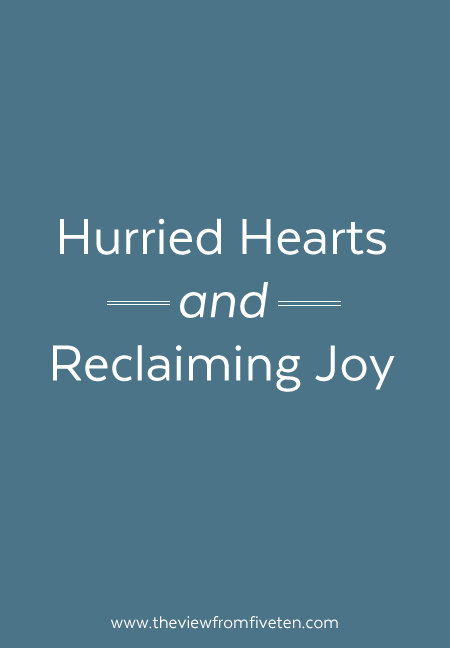 Here's to a God who hushes hurried hearts, reclaiming our joy and seeds in good soil. Around October each year God begins to prick at my heart lessons from my Word of the year. Most years this discernment is an overflow of the harvest. In this year hard stuff, God is calling me deeper to hear His still, small voice. He has me leaning in, looking to a past season where I wrote out my wholehearted joy and unpacking how it parallels to this hard year. Here's what I'm asking myself and how you can join me in reflecting on your year: What has He been teaching you through the seasons of 2017? How has He blessed you? What revelation has God meant for your year, for your growth as a believer? Start a conversation with God about your year now. Don't wait until December winds down to begin reflecting on your year; He wants to grant us discernment and that takes time for us, friends. Beth Moore said in a study, "the soil of every season is fertile ground." Let's believe that with her as we go deeper still with Him.